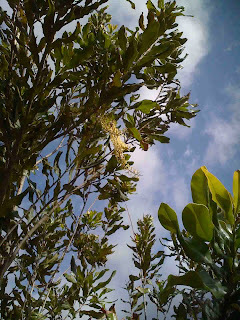 A few years ago I planted some macadamia trees in the orchard. It takes a few years before they begin to bear fruit. 2009 was the first year that we had blooms. I was very excited! This small cluster of blooms produced 6 nuts. Of these, all disappeared over the summer (I blame the ravens) except one. Last week, I harvested the one, special nut. 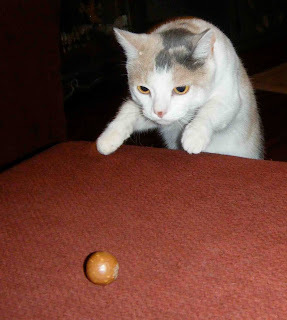 I brought the nut inside to take pictures, but the new kitten, Jellyfish, was convinced that it was her personal playtoy. Jellyfish attacks the unsuspecting nut! I had to act fast. 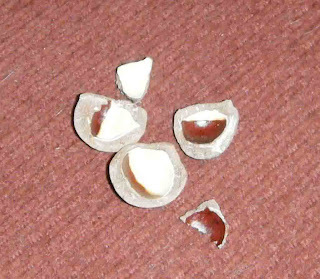 Armed with a bit of foam pipe insulation and a hammer, I whacked the nut and extracted the precious seed. Yummy! And yes, that is a cow floating above my head. 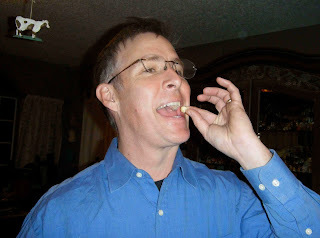 This is a ranch, after all. Nothin' left but the shell. Next year I'm expecting more blooms and nuts, wish me luck.